Scientific Name(s): Clerodendrum quadriloculare (Blanco) Merr. Photographer(s) Appreciation: Today's guest writer and photographer is Dr. Lee Foote, who is a professor at the University of Alberta and director of the University of Alberta Botanic Garden. Thank you, Dr. Foote! Botanically speaking, mid-winter in Alberta is a slow period. A few weeks ago, it was -4°C and lightly snowing as I sought orchid blooms in the Tropical Showhouse at the University of Alberta Botanic Garden. Fresh off the Christmas celebrations, the fireworks of New Year’s and the Muslim celebration of Milad al Nabi (Muhammad’s birthday), I immediately thought of fireworks when I stumbled across the flowers of a small tree, Clerodendrum quadriloculare. Known as starburst, shooting star or bronze-leaved glorybower, this tender little import from southeast Asia and the Philippines–both parts of Malesia–is like a botanical fireworks display. It sends up dozens of 12-cm corolla tubes in a pin cushion array bringing to mind an exploding star shell, a punk hairdo or a psychedelic hedgehog. So back in our library and reading up on this 2007 accession, I learned it was one of the many genera in Verbenaceae that were moved to Lamiaceae during the detailed reclassification based on genetic analyses (see: Cantino, PD et al. 1992. Genera of Labiatae: status and classification. Pp. 511-522. In: Raymond M. Harley and Tom Reynolds (editors). Advances in Labiate Science. Richmond, Royal Botanic Gardens, Kew. ; Wagstaff, SJ et al. 1998. Phylogeny in Labiatae s.l., inferred from cpDNA sequences. Plant Systematics and Evolution 209(3-4):265-274). The opposite and petiolate leaves have upper surfaces of buffy green which contrast beautifully with their bronzy purple undersurfaces. This leads to the vernacular/generic mash-up name of “bronze-leaved clerodendrum”. That this plant thrives in direct tropical sun may help explain the density of flavonoids, carotenoids and refractory waxes employed for protection from UV rays (sensu Middleton, EM and AH Tetramura 1993. The role of flavonol glycosides and carotenoids in protecting soybean from ultraviolet-B damage. Plant Physiology. 103(3):741-752). For showy foliage, this contrast must be impressive and flashy on windy days; conditions that our greenhouse plants will never experience. The coevolution of such long corolla tubes raised questions in my mind about the specialization required of pollinators to access basal nectar depots. In southern Florida, hummingbirds and butterflies are successful in nectaring on these blossoms but because hummingbirds (Family Trochilidae) are endemic to the Neotropics, it seems more likely that the diverse moth, butterfly and bat fauna of the South Pacific fill this role. Comments from knowledgeable readers would be welcomed. Beta testing this remarkable plant on my 12-year old daughter generated sighs and rolling eyes until I got to this part–various internet sources (take them for what they are worth) mention that in regional folk medicine a mashed poultice of this plant may be used to reduce flatulence. That got her attention! She recommended it for all her dad’s friends who are full of hot air! Who knows where a life-long love of botany is born? I was struck by the instantaneous delivery of an ancient folk remedy from the oral tradition being able to appearing digitally a half a world and nine growing zones away. 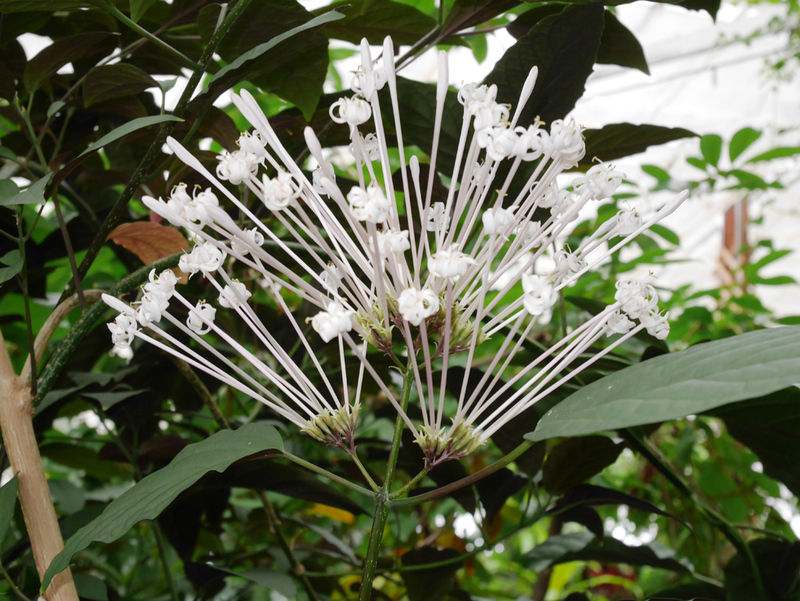 The Natural Resources Conservation Service (NRCS) lists Clerodendrum quadriloculare (PDF) as highly invasive through vegetative spread and because of copious seed dispersal by insects and birds, including viable seed passage through the digestive tracts of birds. Deliberate planting in warm climates (Zones 9-11) out of its native range is discouraged. We don’t feel that there is much escape risk here at 55° North latitude however, so let the winter fireworks continue in our greenhouses as the snow continues to fall! Thanks to University of Alberta Botanic Garden’s Collections Manager Laura Caddy (2018 edit — now at UBC Botanical Garden) for proofing this accession and correcting distribution information. We saw lots of these in gardens and parks on Oahu, but always with purple rather than white flower stems. I assume that’s what the “(Blanco)” is about in the name (?). I don’t understand what it means having that in parenthesis, am interested to understand that. According to a online ‘Botanary’ (Botany + Dictionary), “clerodendrum” means ​”Chance (or luck) tree” and “quadriloculare” means “having four compartments”. Are these translations accurate? If so, there is a whole genus of ‘lucky’ plants! Which part does “quadriloculare” refer to? What a great descriptive write up and personal story to go with the fine photo of this lovely flower. Thank you Dr. Foote! Ditto Lynne’s comment. Fun and personal that what botany should be. Another fascinating plant and I am happy you also added the invasiveness properties Dr. Foote. Thank You. Lynne and Michael: Thanks for the kind words and thanks to Daniel for keeping beauty and information in front of us from around the world. Many people are very plant-centric, and the pure unadulterated beauty and intrinsic wonder of plants feeds their souls. I have a dash of that but the history, human involvement and utility also colour my view of plants. There really isn’t a wrong way to enjoy them, some with butter and salt even!